So, where to take my daughter for her first meal out? We had our first pediatrics appointment this morning and it was the first time we had been out of the house since coming home from the hospital. After our 11:30, we had the debate on whether we wanted to chance sitting down for lunch somewhere or grab something to go. Since L was crying as we were driving, we opted for the picking something up to go. We were both in the mood for something lighter and something quick. For whatever, we have neglected the Deli at Bacchus Wine & Spirits. 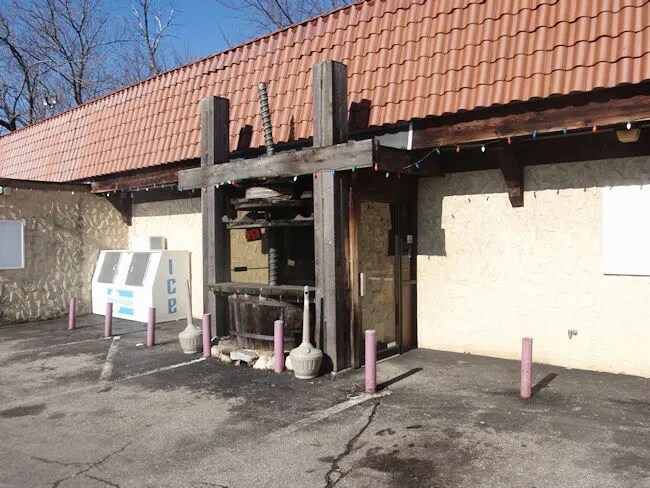 I always see the smoker going when I drive by and even though it wasn’t fired up today, I still wanted to try their deli sandwiches. 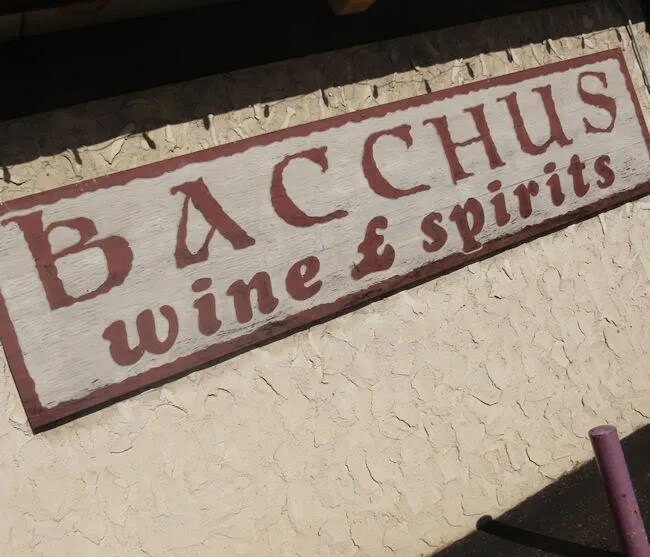 Bacchus Wine & Spirits is at that weird intersection where Oakland Drive, Whites Road, and Parkview Avenue all sort of intersect. The building is across the street from the D & W Fresh Market which makes it easy to find. Bacchus is a specialty food store that specializes in unique cheese, sausages, and meats as well as liquor store with a wide selection of liqour, wine, and beer. They’ve been in business since 1971 at that same corner. The deli is sort of off to the right when you walk in. The menu hangs from the ceiling and there are eight sandwiches that use premium meats, cheese, and breads. We stood there for a few minutes until a woman in another part of the store noticed. She came over and asked what we were in the mood for. I had no problem finding a sandwich. I ordered the #2 which is the Pastrami Sandwich. The meat is Sy Ginsburg Pastrami made by United Meat & Deli in Detroit. It’s served on Zingerman’s Rye with Emmentaler Swiss Cheese it’s finished off with yellow mustard, then wrapped with a pickle in butcher paper. J ordered the #7 which is the ham sandwich. 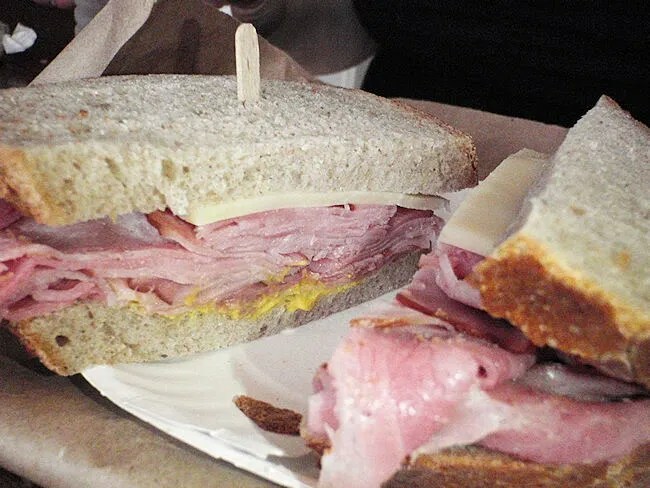 The ham is Usinger’s applewood smoked ham on Zingerman’s Rye with Swiss cheese and mustard. Both sandwiches took about five minutes to make and the lady who made them took them over to the cash register near the doors to ring them up. I grabbed a Mt. Dew out of the cooler next to the deli for something to drink. They also had Boylan Cola’s and a couple of selections of Root Beer, but I was craving a Mt. Dew. The total for the two sandwiches, a pop, and a couple of caramel’s from next to the cash register was just over $21. Seems expensive, but you’re getting high quality ingredients. We chose to take our sandwiches home with us even though L was doing really good in her carrier. If you should choose to stay, there are a couple tables in the deli area where you can eat. When I unwrapped the butcher paper when I got home, I found exactly what I was looking for. 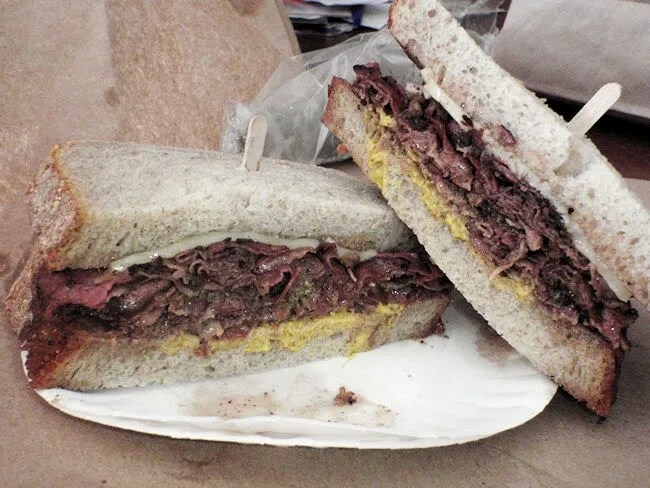 A juicy, tender pastrami sandwich with just enough mustard to give it a little zing on bread with a crusty crust but soft, chewy middle. The sandwich was delicious and very filling. J said pretty much the same about hers. The only thing different between our two sandwiches was the meats. Almost as soon as we got home, L got hungry and wanted to eat, so mommy had to eat one handed again…..yet another reason I picked a deli for lunch. Bacchus has an incredible deli. It’s so much more than your typical deli sandwich. They take the time to hunt down high quality ingredients which make all the difference in these sandwiches. I love searching for and reading all the comments on the Bacchus restaurants and eateries across the US–thanks for this review!